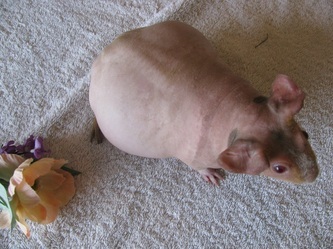 skinny pig is characterized by its’ unique trait of being mostly hairless. They have no fur other than a few hairs on the muzzle, face, and legs. Due to careful breeding, skinny pigs are just as healthy as the regular guinea pig and can live long thriving lives when given proper care. Skinny pigs are not physiologically different from its’ furred relatives other than the lack of fur. ‘Skinny’ does not refer to the weight or size of a skinny, but describes the particular breed. The skinny pig’s skin resembles the skin of humans, but has the same needs of a regular guinea pig. Skinny pigs also live to the same age as any other guinea pig when properly cared for. The hairless strain was a spontaneous genetic mutation that was thought to be descended from a lab breed called the IAF Hairless. The gene first appeared at Montreal's Institute Armand Frappier in Montreal, Canada during 1978 out of a Pink-Eyed-White guinea pig from a Hartley lab herd. In 1982 they were transferred to Charles Rivers Laboratory for testing. It was believed that IAF Hairless was to be useful in researching dermatology and skin cancer. It was soon found that they had a damaged thymus (an essential part of the immune system). Due to this, they were not very hardy and had very short life expectancies. One breeder brought an IAF Hairless home, and bred it to an American Guinea Pig producing the first ‘Gene Carriers’. These offspring carried the hairless gene and, through careful breeding, more hairless guinea pigs were produced. The new genetic line was stronger than the initial IAF Hairless as they had an improved Thymus and a stronger immune system. Eventually, the Skinny Pig breed was stronger and people have been purchasing and keeping them as loving pets. In order to produce healthy offspring, skinny pigs require careful breeding. 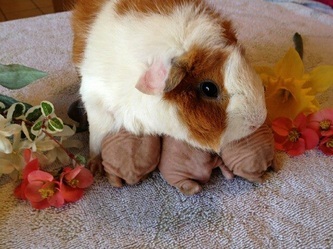 In order to produce healthy litters and develop a healthy line, you must outcross the hairless allele by breeding skinny pigs to regular furry pigs and then though a gene carrier. A gene carrier is any furry pig who has one parent that of which is a skinny, and the other a furry. The Hairless gene is recessive while the furry gene is dominant. Gene Carrier: A furry pig carrying the hairless gene as a recessive allele. When breeding 2 skinny pigs together, all of the pups will be hairless. There is a 25% chance that the offspring will be hairless, the rest will be gene skinny pig gene carriers. Since the hairless allele is recessive and the furry gene dominant, the pups from those litters will have a furry phenotype. When breeding a skinny pig gene carrier to a normal furry pig, 50% of the offspring will carry the hairless gene while the other 50% will be normal.